This is the account of Paul and Ruth as they go to live on Pitcairn Island. 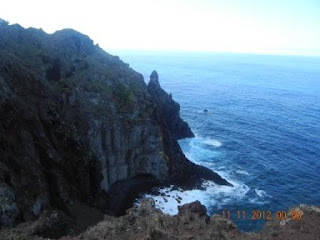 Thank you to all who followed blog of our our adventures on Pitcairn Island. We had a wonderful year there and will always treasure our memories. After leaving Pitcairn we have travelled through a number of countries and have arrived safely in Bangkok. Bangkok will be our base for 2013. With us both being school teachers we can see a huge need here for quality education. We want to work with disadvantaged children that would not otherwise get an opportunity to receive education. We have begun a Christian based six month course called "Children at Risk". We invite you to follow our new blog as we undertake this new adventure. Today (2.12.2012) is our departure day. We leave with mixed emotions. I feel sad to leave this beautiful island behind. Can you believe there are still places that I have not had a chance to explore? It has been a wonderful year for us – full of personal growth and challenges and we are so thankful that we have had the opportunity to be here. We got up early at 5:30am and rode on the quad bike to the Highest Point to watch the sunrise. We could see the Claymore II anchored down at Tedside. We will board at 5:00pm this afternoon. Will we ever return? I would like to think that one day we may have the opportunity but this is quite possibly the last we will see of beautiful Pitcairn. Paul’s final sermon was held at the Seventh Day Adventist Church on Pitcairn Island on the 2nd December. There was a good turnout of people attending to say farewell to us and to welcome to Jean-Claude and Esperance Honoura as new pastors. The farewell luncheon held afterwards was a feast. We felt privileged to hear the speeches and to receive the beautiful gifts. The lidded basket made by Daphne Warren has my name 'RUTH' and 'PITCAIRN ISLAND' woven into the panadanus strips. The dolphin was carved by Dennis Christian. THANK YOU PITCAIRN ISLAND CHURCH. 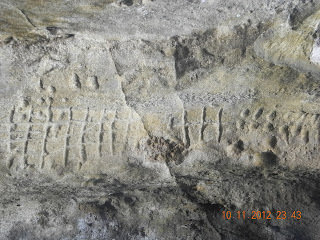 Many people have read and seen pictures of the petroglyphs in the area of Pitcairn known as Down Rope. 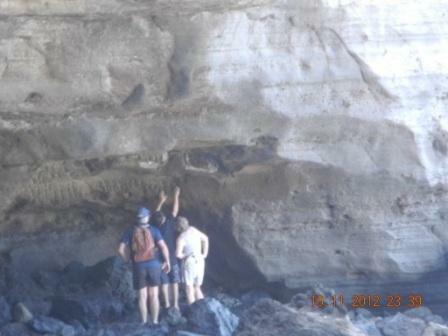 Adventurous tourists climb down the cliff face to see them. Less well known and less accessible are the petroglyphs ‘Down the God’. The route down is not for the faint-hearted. Agility, strength and a good head for heights are the key factors needed for the descent and climb. At the base of the cliff is an overhang. The petroglyphs are carved into the rock. 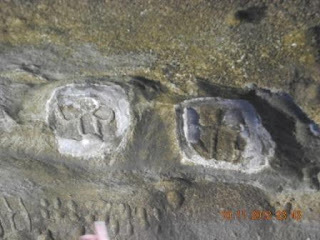 Unfortunately in years gone by an islander chiseled the carvings out of the rock with a view to selling them. When it was pointed out to him that this was not an acceptable thing to do, he returned to the site and cemented them back into place. The cement can clearly be seen. One of the projects looming large for the Pitcairn Island future is the Alternative Harbour Project. In a nutshell, the project is to build a second harbour built on the western side of the island. This will provide an alternative landing wharf and access to the island at times when the weather is not suitable for landing at Bounty Bay. Approximately ten cruise ships call at Pitcairn Island each year. For some of these ships the islanders go out to board the cruise ship to sell souvenirs. For other ships it is possible to off load the passengers onto the boats and ferry them to the Bounty Bay wharf. It is dependent on the age and ability of the passengers to negotiate the boarding of the smaller boats and the weather on the day. The western side of the island, known as Tedside, often has a more settled wave pattern and a lesser swell than Bounty Bay, when the weather is coming from the east. If we are getting a north easterly both Bounty Bay and Tedside can be exposed. Yachts and the Claymore II supply ship anchor at Tedside as often as they anchor off Bounty Bay and the longboat leaves from Bounty bay and travels around to Tedside. Occasionally a passing yacht is unable to call in at Pitcairn because of the weather. To build a harbour and suitable access to the western side is a huge project. Consultant Engineers from New Zealand, Tonkin and Taylor, were involved when the project was originally put together. They will visit the island during the construction period. This project is an ideal opportunity for Pitcairn Island to attract new people to come to the island to assist with the construction. Employment is difficult to find on Pitcairn Island and is one of the disadvantages that anyone considering immigrating to Pitcairn would face. The planning stages of this project are already well under way. Funding for the project will come from the European Union. It is expected to cost in the vicinity of 2.2 million Euros. Initial payments of 1.125 Euros have already been paid. Existing heavy duty equipment on the island will be used and additional heavy equipment will be needed. Tenders have been put out for a ship capable of bringing the heavy equipment to Pitcairn. The time frame for the project includes beginning construction in April 2013, having a concentrated effort and aiming for completion late 2013. The two waka originally left Auckland on 17th August. 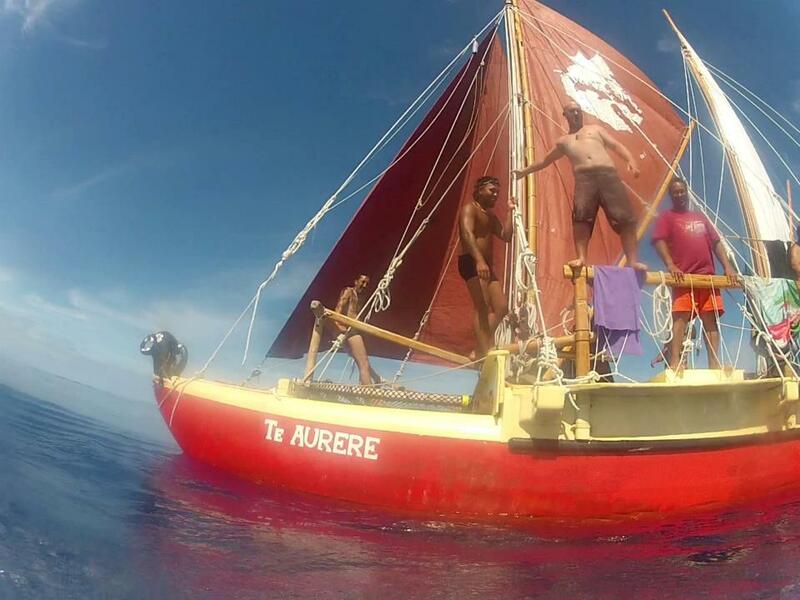 They left Mangareva on 7thNovember and are journeying towards Rapanui. Pitcairn Island is about one quarter of the way to Rapanui from Mangareva. We wish them all well on their voyage. Pitcairn Island has a plant nursery. The building is quite substantial and there is plenty of equipment for propagating and nurturing plants. Sometimes there are vegetable seedlings for sale. There are also trees and shrubs ready to plant out. I went looking for an avocado tree and a mango tree but there were none there. But I did come away with passionfruit vines, pawpaw and two lime trees which I have planted in the grounds of the school teacher’s residence.